Teased during the pre-show for Sony’s main E3 presentation alongside Superhot VR, Sparc is now confirmed to be launching exclusively on PSVR ‘first’ in Q3 2017. The sports game was originally expected to arrive this year on multiple VR platforms. Update (07/26/17): CCP today revealed in a Sony blogpost that Sparc will be launching on PSVR August 29th. Before launch, the studio plans on teasing more character customization as well as taking a build to Gamescom where they’ll be demoing Sparc’s single-player challenges, a series of timed events that test throwing and deflection accuracy in an environment designed to improve skills and help prepare players for human opponents. Original Article (06/13/17): Developers CCP Games, famous for the persistent MMORPG Eve Online, have been at the forefront of VR development for several years, creating the successful VR spin-off titles Eve: Valkyrie and Gunjack. 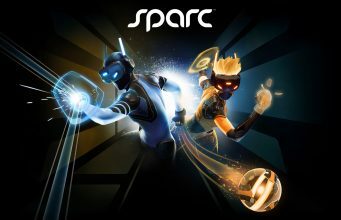 Sparc is the company’s first non-Eve universe title, being presented as an entirely separate, VR sports game. Once known as Project Arena, the game is the result of early experimentation with VR motion control from CCP’s Atlanta studio. The prototype was already in very impressive shape during my hands-on at Eve Fanfest 2016; its particular style of energetic action combined with spectator features struck me as a great candidate for a true VR sports game. When the project reemerged as Sparc, it had embraced the sports angle in its design aesthetic, with more tangible ball projectiles rather than discs, and the robotic avatars had received an athletic makeover. Now that the game is nearing launch, CCP is pushing this angle further, coining the term ‘vSport’, and claiming to be the ‘first-of-its-kind, full-body virtual sport’. At our hands-on at GDC 2017, and at this year’s Eve Fanfest, the game was still being discussed as a multi-platform title, due to launch on Vive, Rift and PSVR in 2017, so there must have been a recent decision to introduce a period of timed exclusivity for PSVR. It’s unclear how long this exclusivity will last, but it sounds like PC VR gamers will have to wait until 2018 to play Sparc. The post CCP Games’ ‘Sparc’ to Launch August 29th on PSVR appeared first on Road to VR.